BBC NEWS | Asia-Pacific | Sunset for Korean Sunshine Policy? Sunset for Korean Sunshine Policy? As North Korea test-fires missiles and expels South Korean officials, Korea analyst Aidan Foster-Carter asks whether a decade of co-operation between the two states has come to an end. On Thursday, before dawn, North Korea summarily expelled 11 South Korean government officials from the Kaesong industrial complex. The complex is just north of the demilitarized zone (DMZ) between the two countries, and is a rare example of North-South co-operation. Technically the two countries are still at war, and for years they were at daggers drawn. In 1968, North Korean commandos got within a mile of the presidential Blue House in Seoul, and in 1983, agents from Pyongyang tried to kill Seoul's then military dictator Chun Doo-hwan. The Koreas also occasionally tried peace. But brief rapprochements in 1985 and 1990-92, when a wide-ranging accord was signed but never implemented, did not last long. That all changed a decade ago. The veteran dissident Kim Dae-jung, elected president in 1997 at his fourth attempt, adopted what he called a Sunshine Policy towards the North. The image comes from a Greek fable by Aesop. The sun bet the wind that warm sunshine was a better way to get a man to take off his heavy coat than blowing a howling gale. In practice, this meant that the South gave rice, fertiliser and more to its northern neighbour, on a loss-leader basis, to build confidence without setting conditions or demanding immediate reciprocity. Kim Dae-jung also allowed Southern businesses, NGOs and others to go North. Chung Ju-yung, the redoubtable founder of South Korea's Hyundai conglomerate, built a resort at Mt Kumgang on the east coast. After a slow start, well over a million South Koreans have visited. Tour buses now cross the DMZ daily, and from this month you can even drive your own car into North Korea. The next president, Roh Moo-hyun, continued the Sunshine approach. Like his predecessor, he went to Pyongyang to meet the North's leader Kim Jong-il - although strictly it was the turn of the "dear leader" to come to Seoul. That summit saw an agreement to expand business co-operation. Besides the Kumgang and Kaesong zones, there were ambitious plans for joint shipbuilding, mining, and repairing the North's crumbling roads and railways. 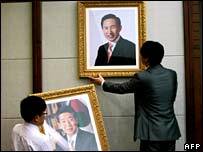 All that changed, though, on 19 December, when South Korean voters overwhelmingly rejected a decade of centre-left rule and chose a conservative, Lee Myung-bak, as president. Though mainly fought on domestic issues, the election showed that there was growing disillusion with Sunshine. Despite a decade of aid, North Korea had opened a little - but hardly softened. Pyongyang still flatly denies holding any South Koreans, even though Seoul knows it has at least 1,000 - mostly old Prisoners of war and fishermen abducted since 1953. Above all, North Korea's nuclear test in 2006 was a slap in the face for Seoul. Critics say that Southern no-strings aid, some in cash, helped Kim Jong-il build his nuclear arsenal. Lee Myung-bak has vowed to change that. Humanitarian aid is to continue, but deeper ties will depend on the North giving up its nuclear weapons. Six-party talks have been stalled for three months, since Pyongyang missed a year-end deadline to declare all its nuclear activities. 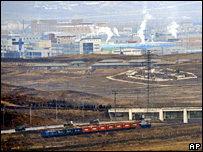 The new unification minister, Kim Ha-joong, recently said that Kaesong would not be expanded unless the nuclear issue was resolved. That prompted the North's latest move to expel the centre's managers. Pyongyang will also be angry if, as expected, the South votes for a UN resolution criticising its dire human rights abuses. In recent years, Seoul has drawn flak for abstaining on this issue. In fact, critics say Sunshine has not helped oppressed North Koreans, but rather bolstered the regime which oppressed them. Until now the media in North Korea, which normally castigates Southern conservatives as traitors and pro-US flunkeys, had been silent on Lee Myung-bak - unsure what to make of his rather mixed signals. No old-style Cold Warrior, Mr Lee has floated plans to invest in the North and raise it out of poverty - if, and only if, the dear leader gives up his nukes. The Kaesong expulsions are thus a shot across Mr Lee's bows - and carefully calibrated. Only the South's bureaucrats have been kicked out. Otherwise it is business as usual at Kaesong, for now. Both sides need the money, though the North's need is far greater. If Seoul also raises the North's human rights abuses, Pyongyang will retaliate further. Mr Lee has already suggested linking aid to the return of its abductees. Japan, which has far fewer kidnap victims, has put this top of its agenda and imposed sanctions on North Korea. The trouble is, as Mr Lee will find, neither sticks nor carrots work with North Korea. If giving handouts merely made Kim Jong-il greedy and arrogant, conversely there is no evidence that pressure or painting him into a corner works any better. Indeed, some fear that a cornered rat is more likely to lash out in desperation. On the nuclear issue and more widely, it is Pyongyang that has painted itself into a corner. But even Southern conservatives fear the chaos that would follow regime collapse. As South Korea's new president is learning, tough talk on the North is easy - but finding a workable balance between carrot and stick is far harder. He himself is not that interested in the North - he had planned to close the unification ministry, folding it into the foreign ministry - and one wonders if he will just leave North Korea to stew in its own noxious juice. If he does, it is ordinary North Koreans who will suffer. With floods causing a poor harvest last year, endemic malnutrition could tip over into renewed famine. Yet a proud Pyongyang had not yet asked the South for the usual fertiliser and rice aid. Presumably it now has no plan to - for fertiliser the season is already almost too late. Unconscionable as North Korea's behaviour is, a return to the old inter-Korean hostility hardly seems progress. Sunshine, however flawed, prised the Northern door a little ajar. Its asymmetries are easy to criticise. But does Lee Myung-bak have a better plan?